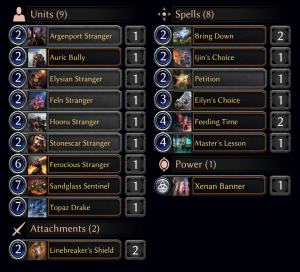 Sealed league discussion: When is it right to skip a week? September was an interesting month for me. 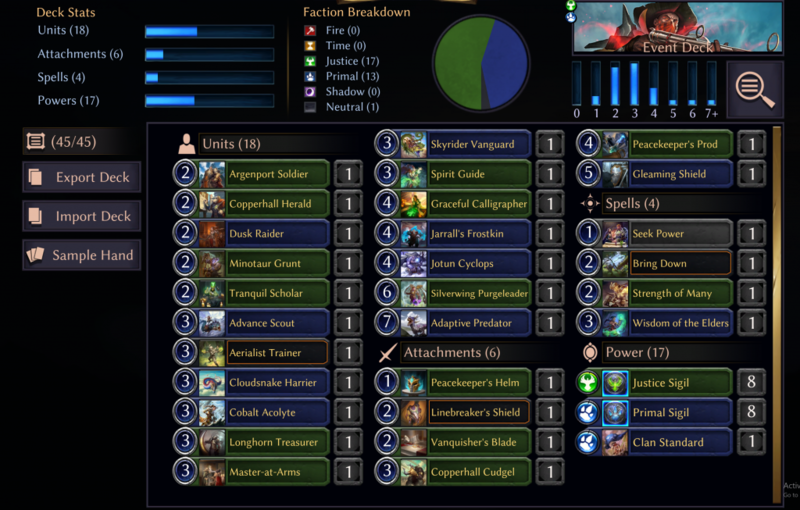 I didn’t spend tons of time playing Eternal this month. It wasn’t because I’m bored of the game or anything like that; I simply had lots of other stuff to do. I did play in the sealed league, though–that’s far too great of a value to pass up! 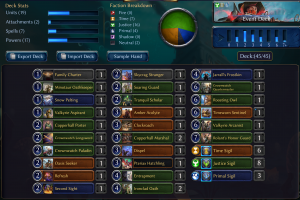 And with the new campaign releasing this week, I’m pretty excited to dive back into Eternal. My September pool, initially, was fairly lackluster. So much so that I actually couldn’t build a 45-card deck without playing some real stinkers. Rather than risk going 4-6 or something like that in week 1, I just declined to play. When Week 2’s packs didn’t help at all, I figured I’d just go all in on Week 4. 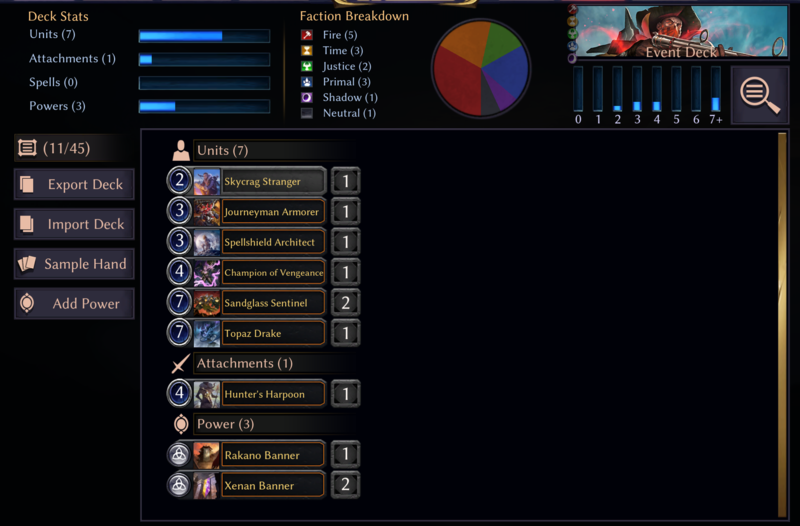 That kind of goes against the spirit of the league format, I suppose, but I’m a competitor at heart, and I’d rather play a good deck than struggle my way through several mediocre weeks, as happened to me in August. 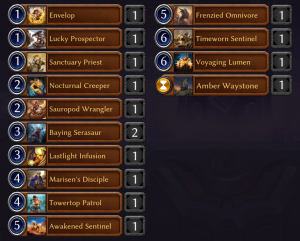 I started that league 8-8 with a weak deck before giving up until Week 4. After waiting for my pool to coalesce a little more, I finished that league on a 20-4 heater to claw my way into the top 500 at 28-12. Had I declined to play those first two mediocre weeks, I could very easily have made a run at the top of the leaderboards. When should you skip a week (or more)? The easy answer here would be “when you feel your deck is below average.” That doesn’t do the question justice, however. The most important thing to keep in mind is that the majority of your packs (8 of 14) come in Week 1. 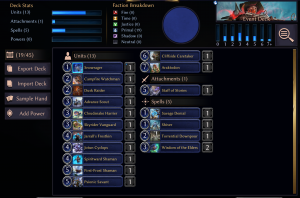 If your starting pool is below average, you are going to have to have some stellar luck to come out with an above-average deck by the end of the league. That’s not to say it can’t happen–my August pool was very much above-average by the end of it, despite starting poorly. However, even if you run hot in your 6 extra packs, you are still likely to wind up with only an average deck. That’s certainly better than a below-average deck, but it still leans on you getting lucky in your bonus packs, which won’t always happen. 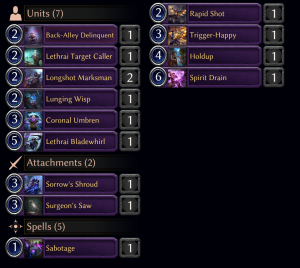 Sometimes you do have to gamble on that, but there are times when it can be right to just jam the bad deck and pray. 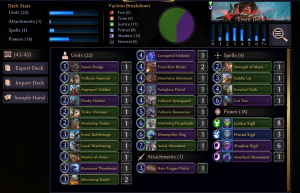 It can be correct to play overall subpar decks in week 1 if they are set up to win through evasion or other “cheese.” Basically, you can assume that most of your opponents are also trying to scrape together a playable deck from not much. 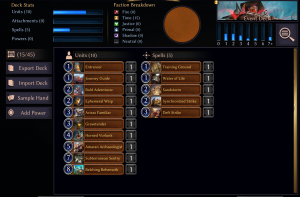 They are going to have limited pieces of interaction, especially in early weeks since two of the factions with good removal (Fire and Shadow) also tend to have the fewest playable units without synergy. This will lead a lot of people to shy away from those factions until they can flesh them out more, meaning your massive beater might just get there. If I have a pool with a bunch of unblockable units and high-power weapons, I’m just gonna jam and hope I don’t run into the guy who opened a few Torches. 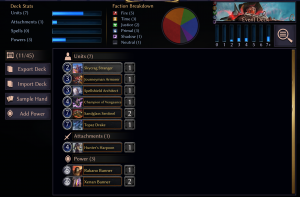 If your pool is one-dimensional and that doesn’t look likely to be fixed by the addition of a few packs, you should play early to take advantage of your one-dimensionality. Your opponents become more and more likely to be able to handle what you’re doing as their pools expand. 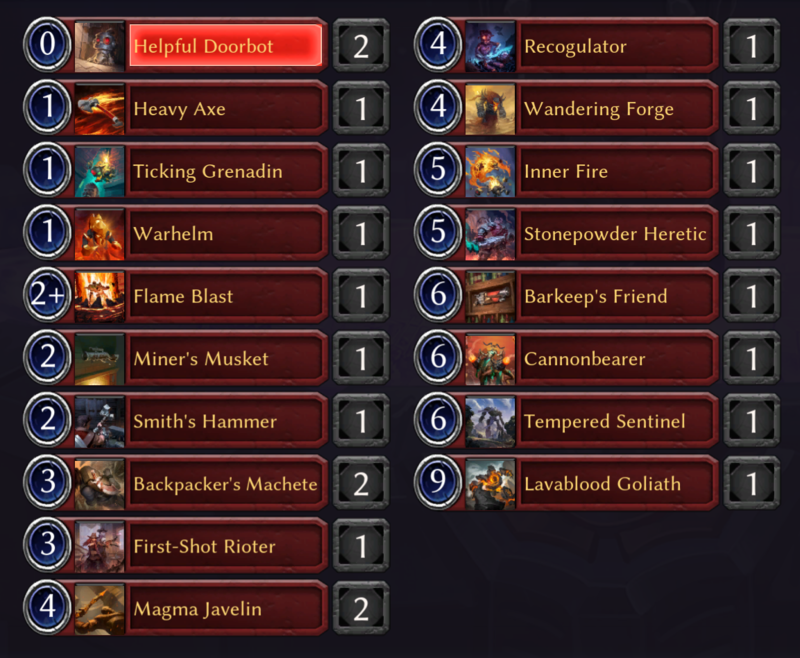 I’m more inclined to wait when there are just a few glaring weaknesses in the deck. If I’ve got a bunch of decent-to-good cards in most facets of the game, but I’ve got a huge lack of removal, I’ll probably want to wait. 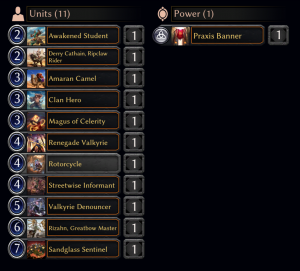 Likewise, if I’ve got four premium removal spells but my units are all 4/1s for 3 or something, I’m going to want to wait. 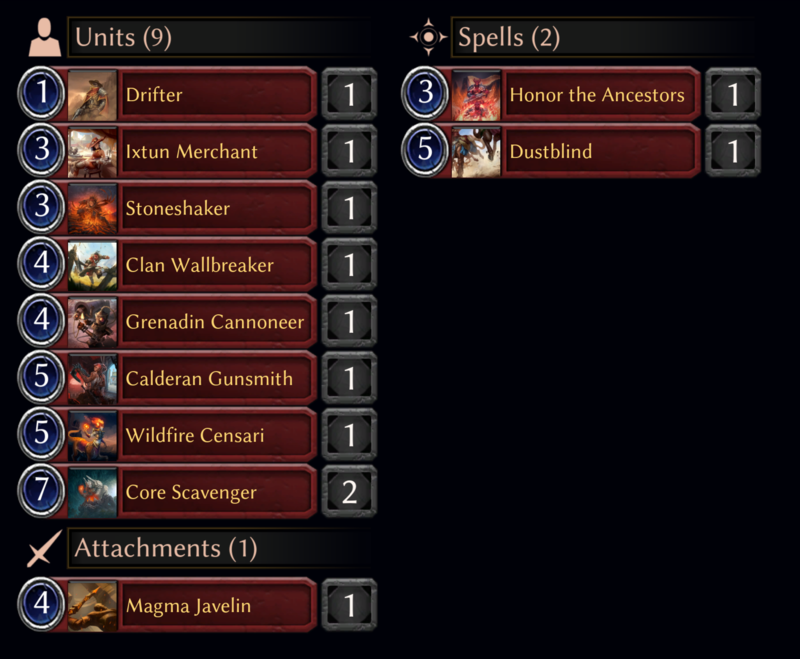 I’ll also wait if I have one very solid deck that’s just missing a few playables. 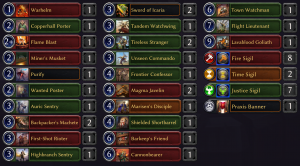 If my option is to play 3 or 4 F’s in my deck full of B’s and C+’s, I’ll probably just wait and see if I can upgrade some or all of those F’s to D’s at the very least. 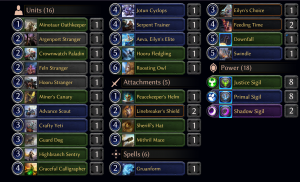 To summarize: If your deck is very weak to particular strategies, but that could be fixed by the addition of just a few key pieces, you should wait. 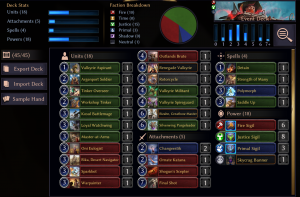 If your deck is weak overall, but you are poised to capitalize on an opponent’s weakness in a certain area (e.g., flyers, large units), you should consider playing early to capitalize while your opponents also have a smaller pool of answers. Obviously, if you just have a stone unplayable pool, you should wait. But that’s not really worthy of discussion, now is it? 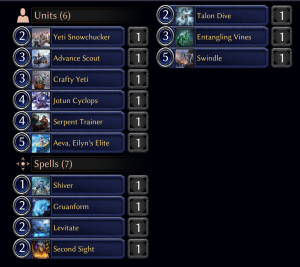 With all that in mind, let’s look at my initial pools so far in this league format and think about what I should have done in these situations. My result: Played every week (5-5 Week 1); 22-18 overall. 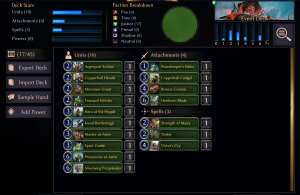 This pool had some very nice relic weapons to function as removal, but it was very lacking in unit density, having to splash for Marisen’s Disciple just to get there on the numbers. Note that I started Lavablood Goliath because this was the first sealed and I honestly wasn’t sure of how fast it would be. I benched him after four games. 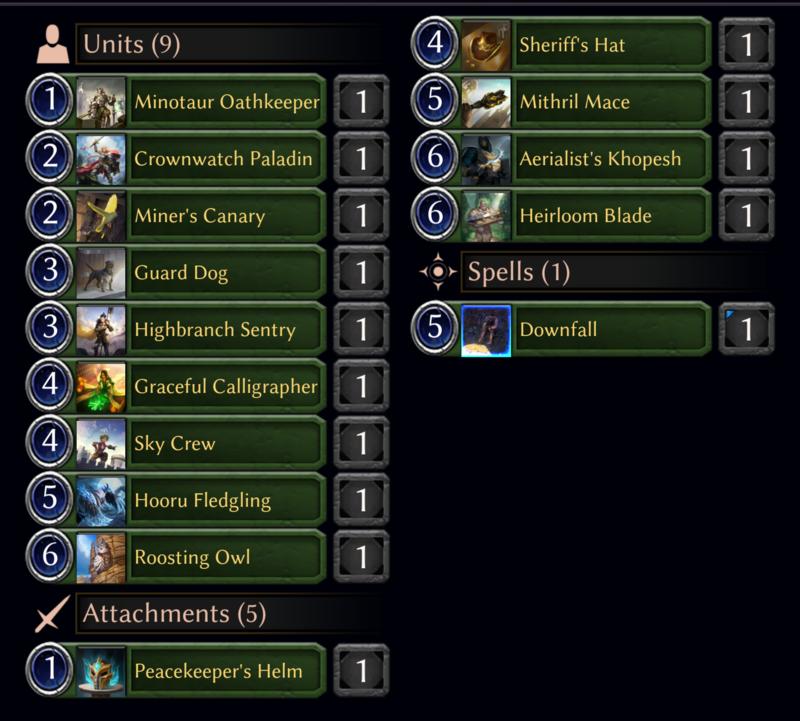 Overall, this initial deck had some glaring weaknesses (units with 5+ health) and very little closing power. I was also splashing two cards on only a single piece of fixing, which is obviously subpar. It leaned too hard on just a few units. If those were dealt with, or if I didn’t draw them on time, I really couldn’t recover. What I should have done: Wait and hope for some better answers to bigger threats, e.g., Vanquish or Stonescar Maul. Another out would have been to hope for better aggro tools to get under some of the bigger threats. Note: I believe I actually played Detain over the Snow Pelting for faction reasons. My result: Played every week. 9-1 week 1, 34-6 overall. This is by far one of the best pools I’ve had, and honestly the least interesting, so I won’t spend tons of time here. The initial pool was by far above average, and it had very few weaknesses. I had fixing, I had a good curve, I had bombs and closing speed. 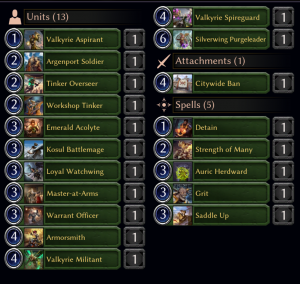 I didn’t have tons of removal, but that was fine, since my units could just outclass or outrace most everything. 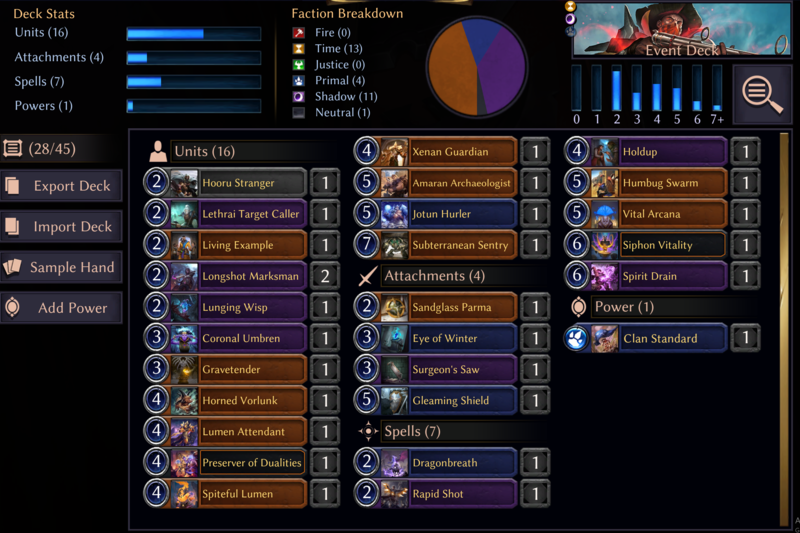 What I should have done: Petition to be allowed to play all 40 ranked games week 1. I was traveling the majority of June, and did not get the chance to play until Week 4 anyway, so I’ll skip this one. Waiting was good enough for a 33-7 record, though! My Result: 6-4 Week 1, 19-11 overall (did not finish the last week due to travel). 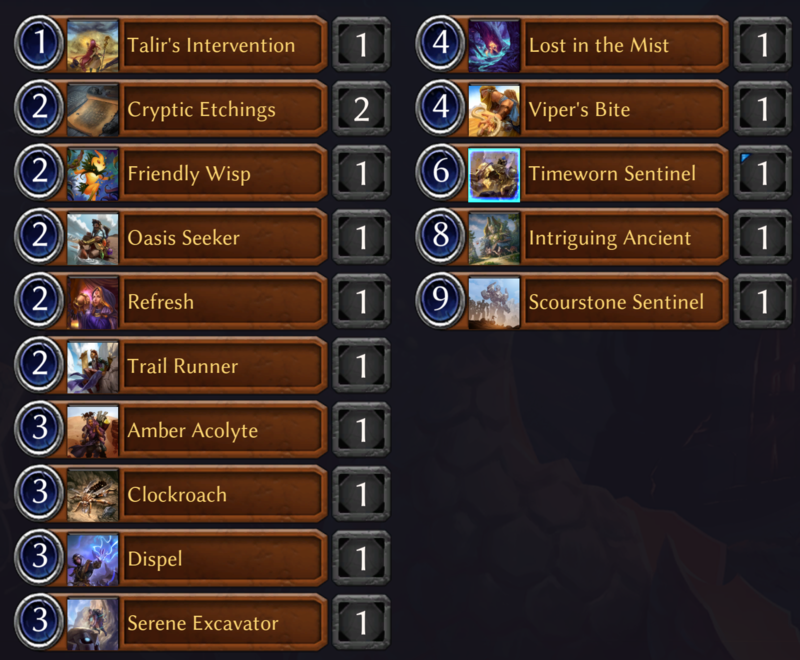 This was shortly after the release of Fall of Argenport, so I didn’t really have a great handle on how strong some of these cards would or would not be. 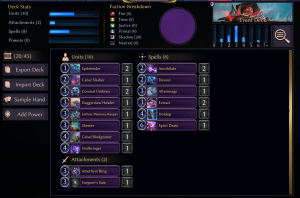 I had some very powerful cards in Preserver of Dualities, Siphon Vitality, Eye of Winter, and Gleaming Shield, but the pool was missing some things overall. 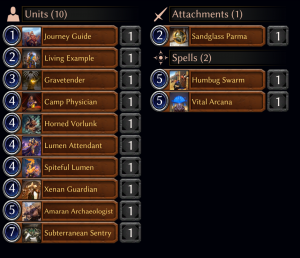 Number one was fixing: Only Hooru Stranger and Amaran Archaeologist did any fixing, and both are very mediocre cards outside of their fixing role, yet I felt priced into splashing Primal because my pool was too thin on Xenan playables, particularly removal. 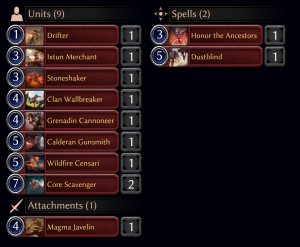 I had to splash Clan Standard and Dragonbreath in order to get there, which are not cards I really want to be splashing. 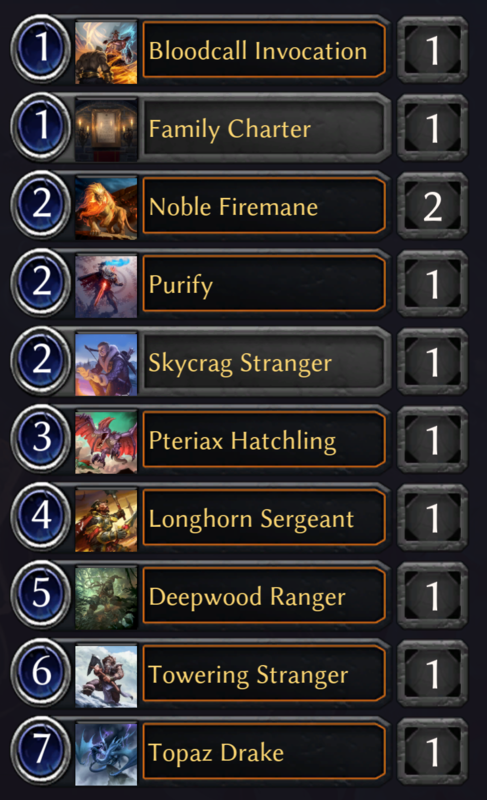 If I could have built a 38- or 40-card deck, my straight-up Xenan deck might have been good enough, but I just didn’t have enough oomph to build a fully Xenan deck. This is a prime example of a pool that would benefit from some fleshing out. 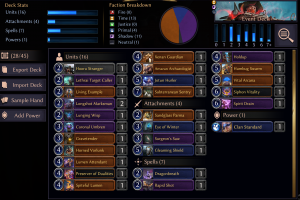 I have some very good grindy cards in this pool–the four powerful cards I mentioned above all benefit from games going long and stalling out. 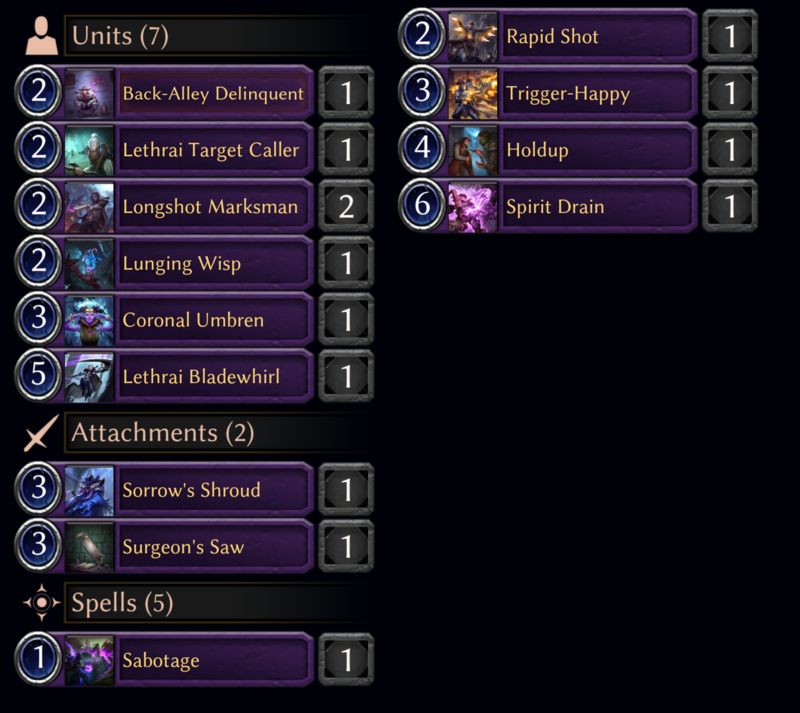 In addition to those, I had things like Surgeon’s Saw and Vital Arcana that would help push me ahead in longer games. 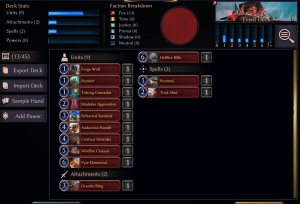 The problem was that my deck just wasn’t consistent enough at executing its game plan, and it didn’t always have good ways to deal with major threats. I didn’t have consistent answers to the most common of game-enders: a bird with a sword. 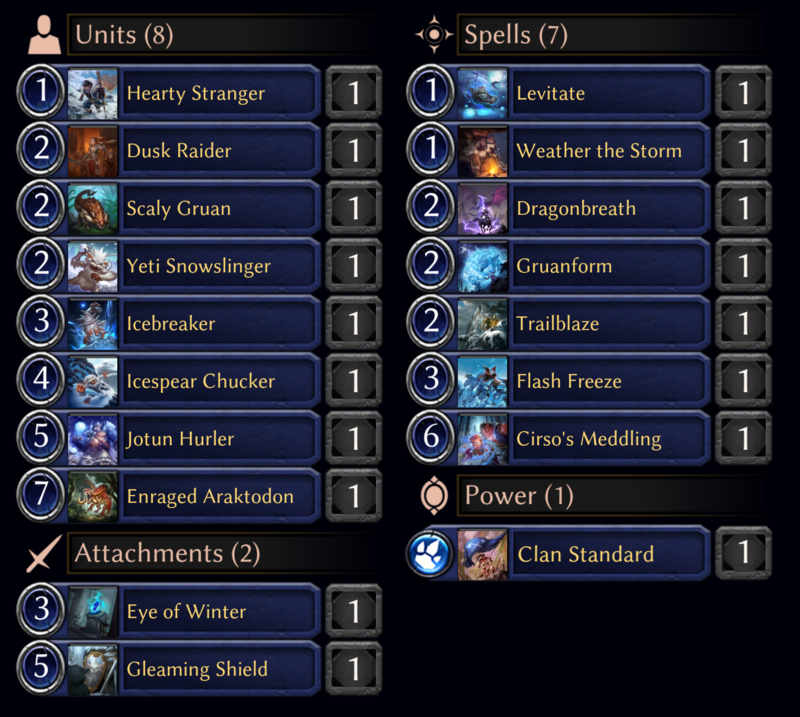 Even when I drew my answers (Eye of Winter, Clan Standard), I sometimes was missing the influence for them. What I should have done: Wait until I found some more fixing or better removal (or both). 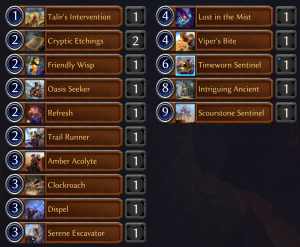 This was a pool that was missing just a few key pieces, and it likely could have been a 7- or 8-wins per 10 games kind of deck, had that come together. Even if I missed on that, I don’t think it would have been much worse than 6 wins per 10 games, given the raw power of some of the cards. As it turned out, weeks 2 and 3 didn’t help me much, but they also didn’t hurt. 13-7 is roughly the same as 6-4, but that means that waiting probably was the correct choice, even if it didn’t pan out. 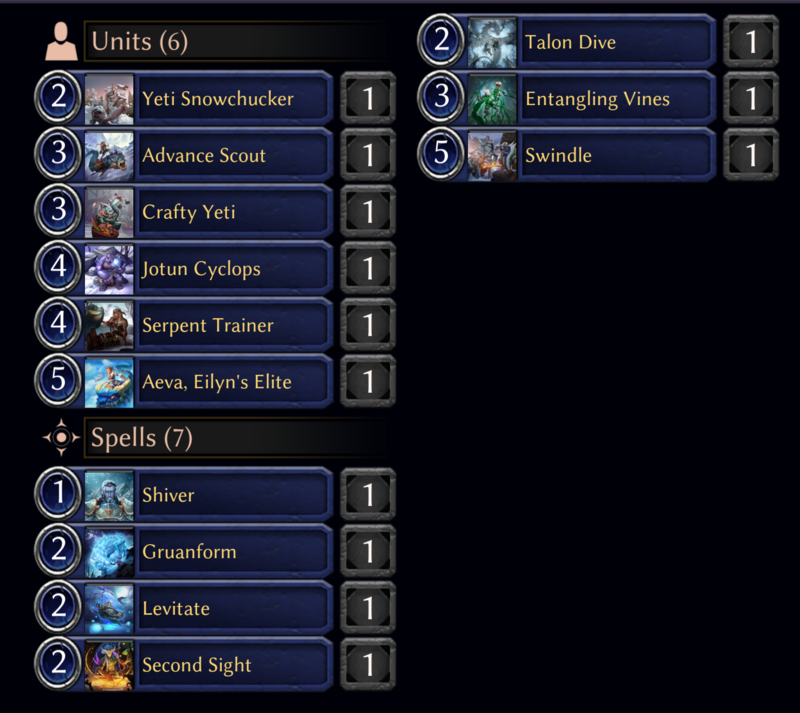 My result: 5-5 week 1, 28-12 overall. Once again, I had a pool with a great deal of powerful cards that lacked the filler to support them. 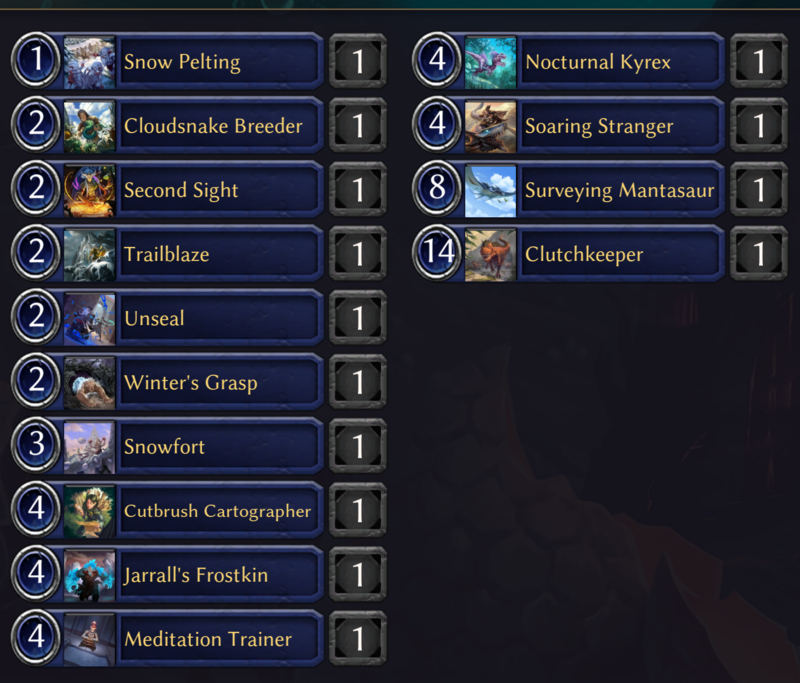 If you take a look at the two decks I considered (note: Primal sigils should not be in the Argenport deck), you’ll see such hits as double Changeestik, Polymorph, Rizahn, Valkyrie Spireguard, and Slimespitter Slug. 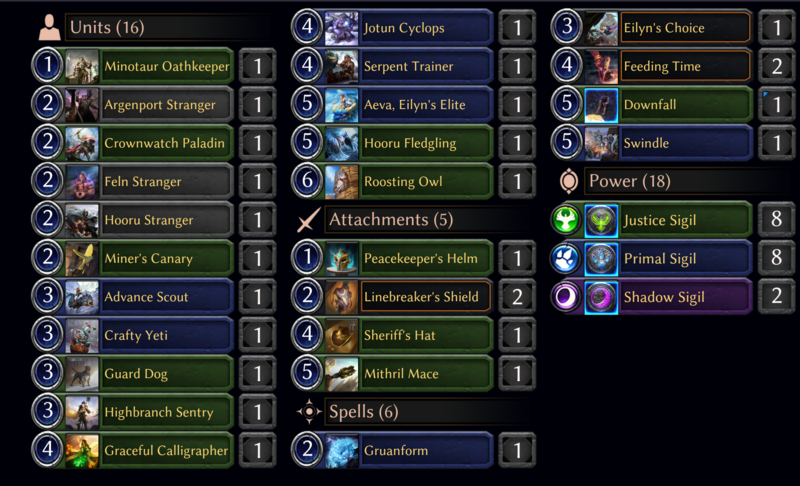 These are all premium cards, but the decks here have some very glaring issues. 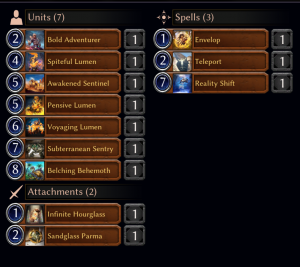 First off, the Argenport deck is all units! 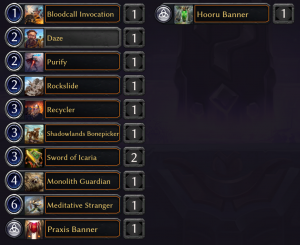 I had no removal outside of the Changeestiks and Polymorph, yet I also had only a single Skycrag Banner to help fix for them. That made them a no-go in the Argenport deck, which had to cast JJ and SS cards as well. 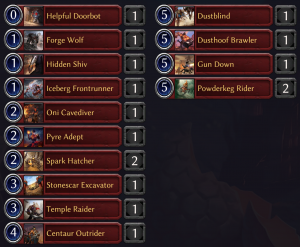 Eliminating the Primal cards left me with a deck that had a whole pile of units, yet many of them were just subpar filler, even if there were some nice bombs in there. 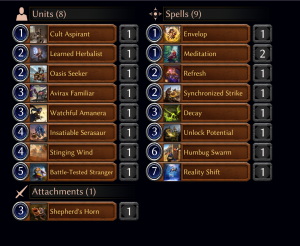 I didn’t even have removal to leverage swarm my opponent out of the game. 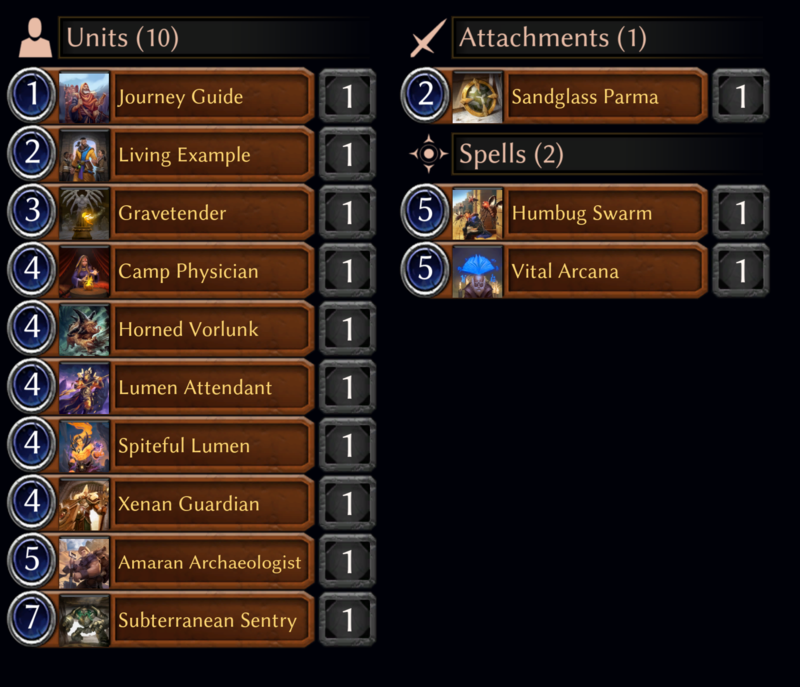 The Rakano deck at least got to take advantage of the Skycrag Banner to give me some hope of playing Changeestiks, but its main issue was the units as well. 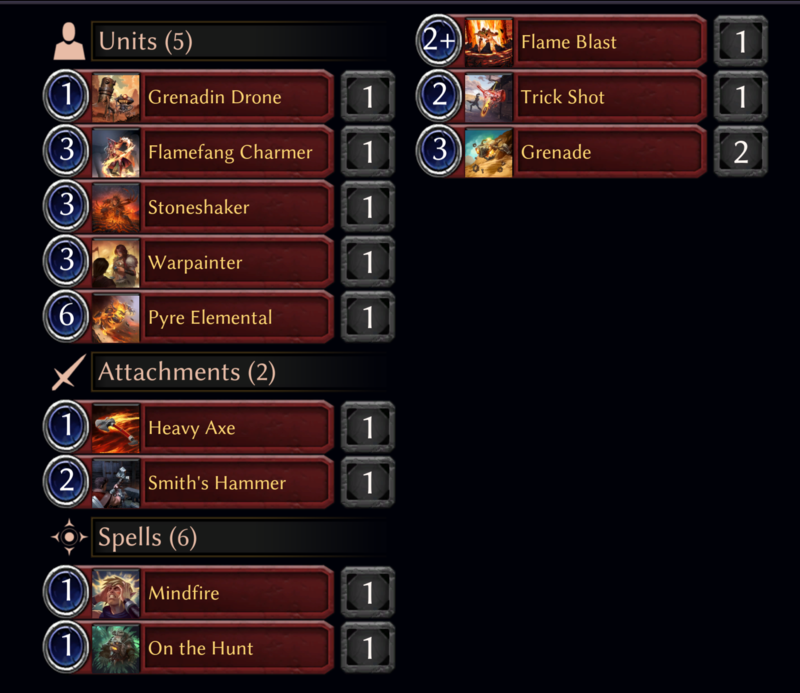 Again, I had some huge bombs, but look at the Fire units. None of those are things I really want to be playing. Even with Changeestiks, the removal just wasn’t there. I thought perhaps the strength of my bombs might carry me, but I finished a disappointing 5-5 after week 1. What I should have done: Pump the brakes and wait until I found some better units for the Rakano version or some better fixing and/or removal for the Argenport version. 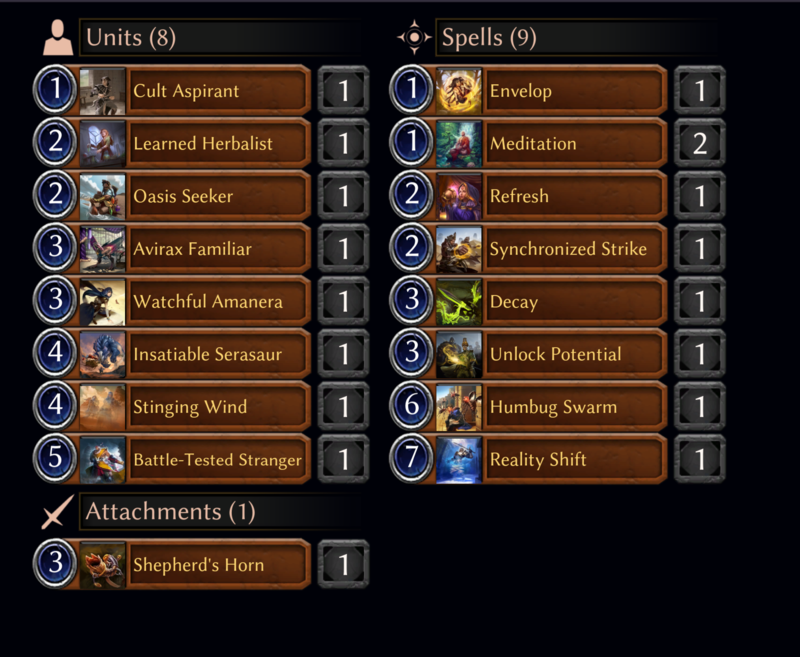 I did wind up finding some better removal and better units for Argenport and, as I mentioned, finished the league on a 20-4 run in week 4. Here’s the pool that really prompted me to write this article. Don’t bother with the Fire or Time cards–they’re pretty much all bad–but have a look at the great JPS cards I opened. I’ve got a high density of flyers and some nice weapons to slap on them. Shadow has four premium removal spells and another playable one in Spirit Drain. One problem: The density just isn’t there. Shadow has maybe 3 playable cards outside of the removal spells, and neither Primal nor Justice has the depth to make up for it. 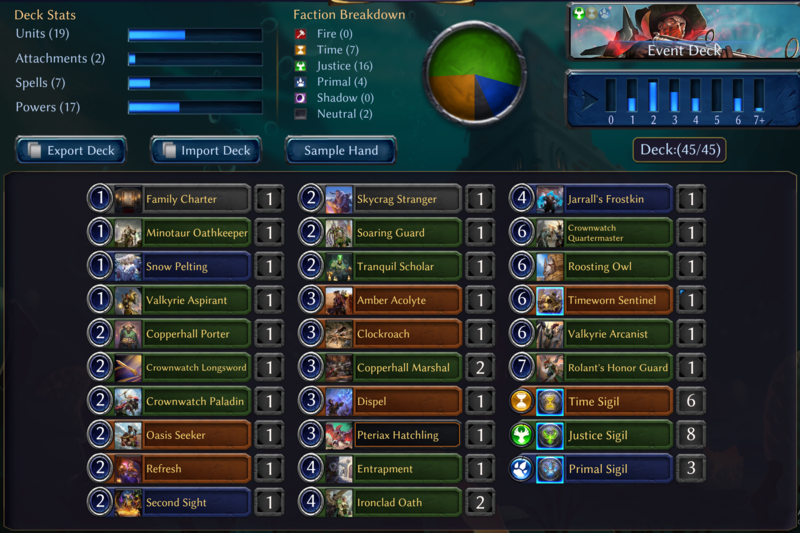 Primal and Justice had a technically playable deck between them, but it had some major issues, namely that there was very little interaction, and I didn’t quite have the unit quality needed to play a strong tempo game. 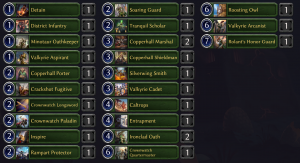 The only deck I could put together that looked remotely playable was to add the Annihilates to my Hooru base, but I had no fixing to help with the splash. So the question I had to ask myself was: Will any of these decks come together if I can open just a few missing pieces? 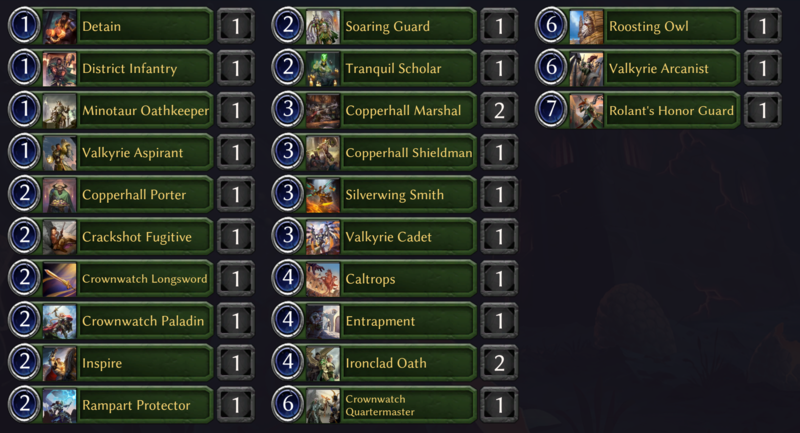 My Hooru deck in particular had some real promising signs: some reasonable 2-drops to trade off early, yet that still remained relevant later (Tranquil Scholar, Copperhall Herald, Dusk Raider), and a bunch of reasonably efficient flying threats. That combination leans toward a tempo deck, where I’m just trying to disrupt my opponent’s ability to block, with things like the Peacekeeper’s Helm and Strength of Many that I already had. 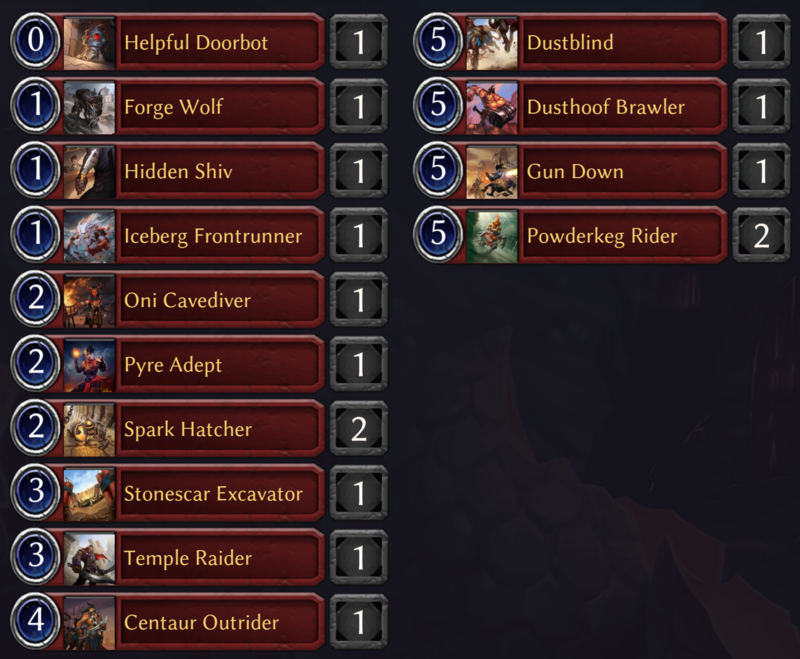 The pool had enough reasonable bodies already; just a few upgrades and some additional ways to push through would wind up turning this into a pretty savage deck. 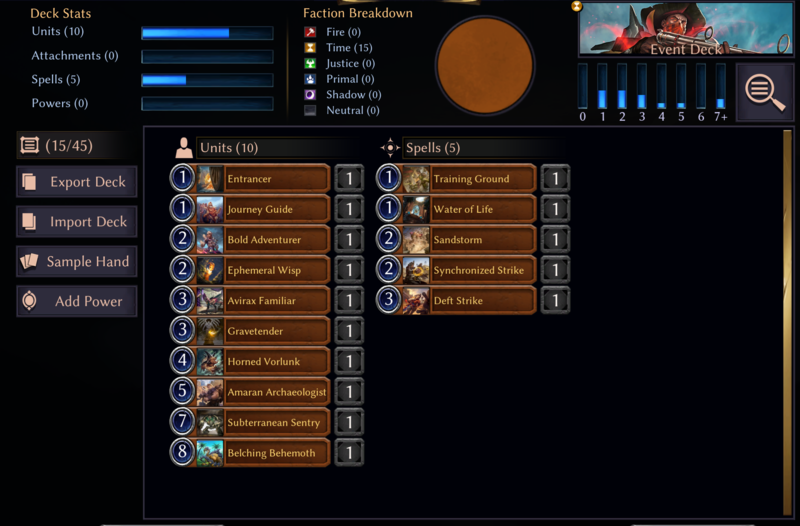 An Argenport or Feln deck could easily come together as well, if I managed to get just a few more playable cards in those factions. 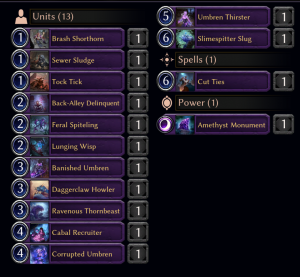 With the solid Shadow removal I already had, it wouldn’t take many decent units to flesh out that deck either. 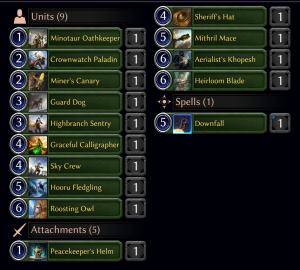 That meant that I had outs to several potentially great decks, if I was able to get either decent Shadow units or a few tempo plays for the Hooru deck. Had there only been one path forward, it may not have been correct to wait, but having two completely separate needs means that I’m very likely to get there on at least one of them in my next six packs. 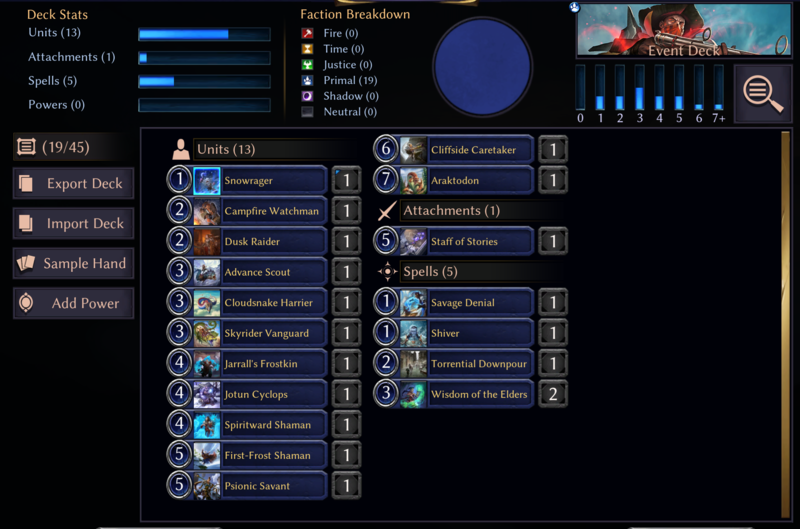 Note: I actually have no idea what happened to Kosul Battlemage here. I don’t think I actually played him. Whoops. I’d probably have cut Longhorn Treasurer for him. Shadow never really came together, sadly, and without fixing I wasn’t able to splash the Annihilates. Fortunately, Vanquisher’s Blade, Linebreaker’s Shield, Peacekeeper’s Prod, and Mirror Shield were exactly what the doctor ordered: Spellcraft weapons (yes, I know Prod isn’t technically Spellcraft; it’s close enough). 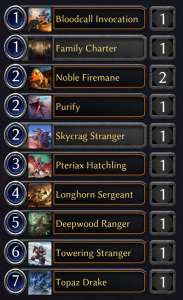 While I had a disappointing last 10 games with the deck, going 5-5, I started 23-7, which positioned me for a top-100 finish if I could keep up the pace. Sadly I had to settle for 200ish, but that’s still good enough to lock up my premium legendary for the month. 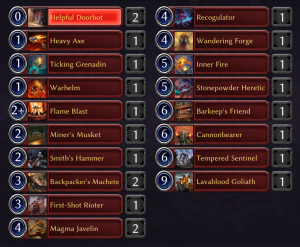 The biggest issue with this deck was the faction requirements. 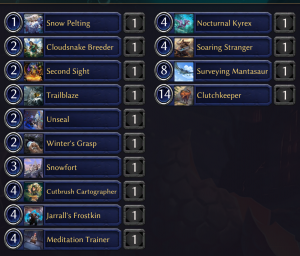 Peacekeeper’s Prod did rot in my hand a few times, and there were a lot of early dual-influence cards like Aerialist and Cloudsnake Harrier that gave me fits. Seek Power helped, but I’d have killed for a Stranger or Banner to flesh things out more. 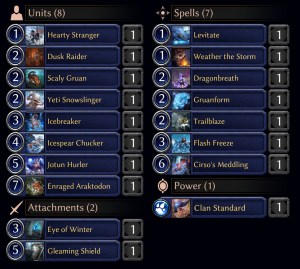 My pool this month is quite promising. Once again, Fire and Time just have very few redeeming qualities. It seems I almost always end up in Justice, Primal, and Shadow, but that shouldn’t be overly surprising because they have the highest concentration of flying threats. Sealed revolves around evasion and how well set up you are to deal with it. This pool is full of juicy flying goodness, paired with some solid dorks to gum up the ground. 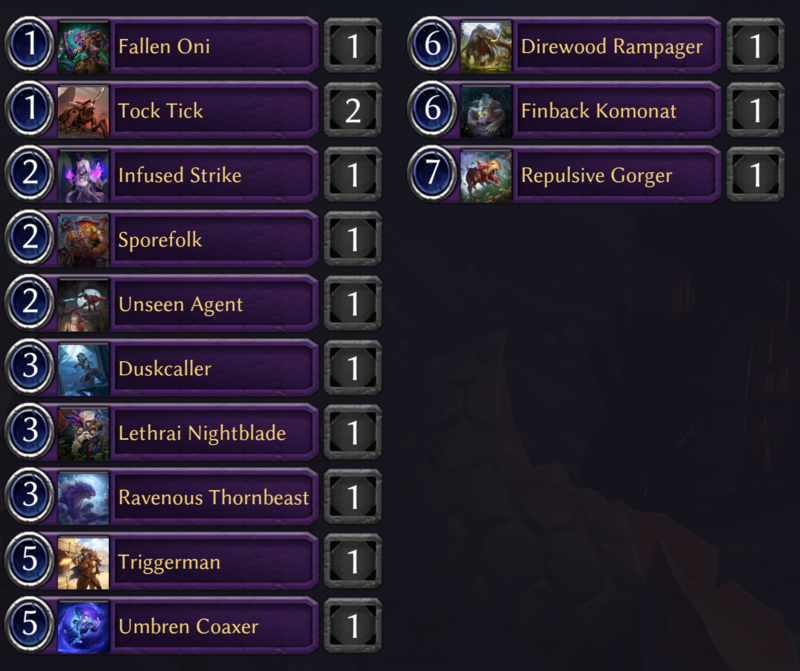 Most of my 2-drops double as fixing for my two copies of Feeding Time. My 3s are unexciting, but they block well and have enough health that my weapons can turn them into real threats. My top-end is jam-packed with bomb flyers and spellcraft weapons, which is exactly where I want to be. This is exactly the kind of pool you want to play in the early weeks. 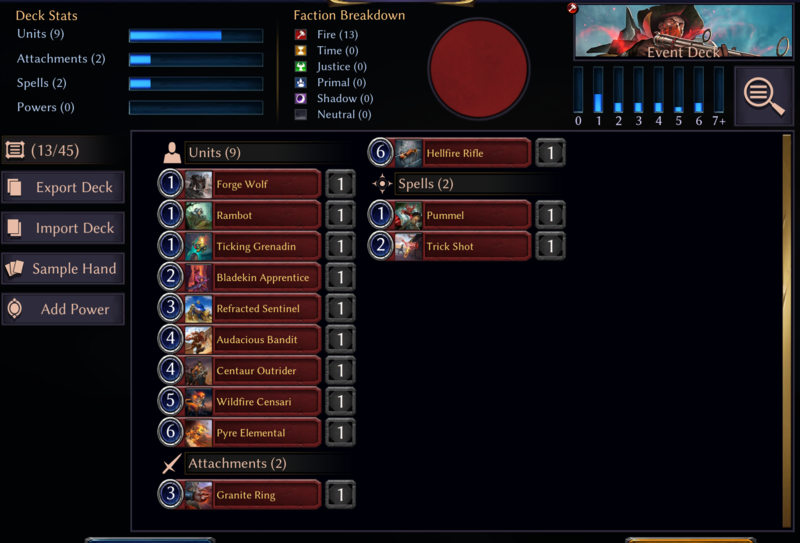 When you have a deck that has a very well-defined plan like this one, backed up by good removal, you’re rewarded for playing early because your opponents are unlikely to have similar consistency and ways to stop you, and their best ways to win are often to try and steal games with lots of weapons. 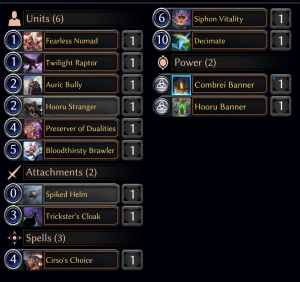 My deck was ideally poised to mess with that, since I had 4 outright ways to kill large units, as well as the spellcraft stuns to just beat down past them. In the early weeks, it’s worth noting, cards like Downfall are more valuable. Ordinarily, I’m very down on Downfall because it simply costs too much relative to what it does. Vanquish is very powerful because it offsets the risk (your opponent has no target for it) with extreme tempo (you kill their 6-drop for 2 power). Downfall fails at that. 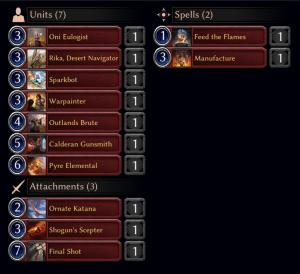 However, as I mentioned before, the go-to way to win when your pool is thin on playables is to slap weapons onto your few reasonable units. 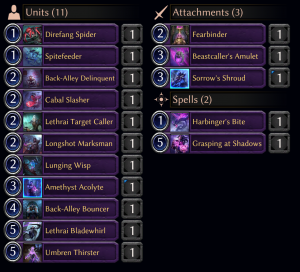 Downfall is decent at hosing that strategy, which makes it a solid play in early weeks, but something I’ll quickly drop as my opponents’ decks becomes more and more streamlined. 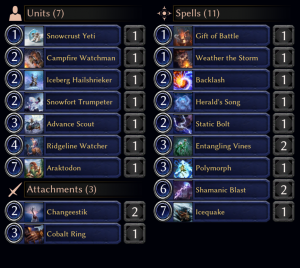 Unfortunately, I did wind up dropping three games, but I did so due to power issues. Twice I got stuck on 3, once I drew 11. 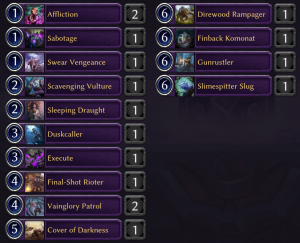 During the games where variance was not hosing me, however, I mostly dominated. Only one or two of the games were remotely close. So, despite the good-but-not-stellar record, I was rewarded for playing week 1. 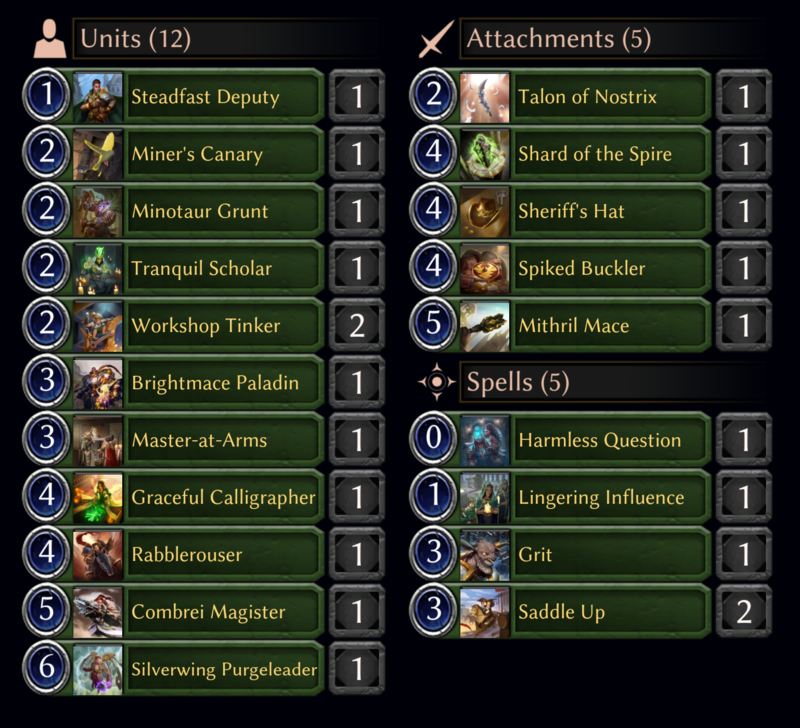 Most of my opponents were playing some dubious synergies and units, but I didn’t have any of those issues. 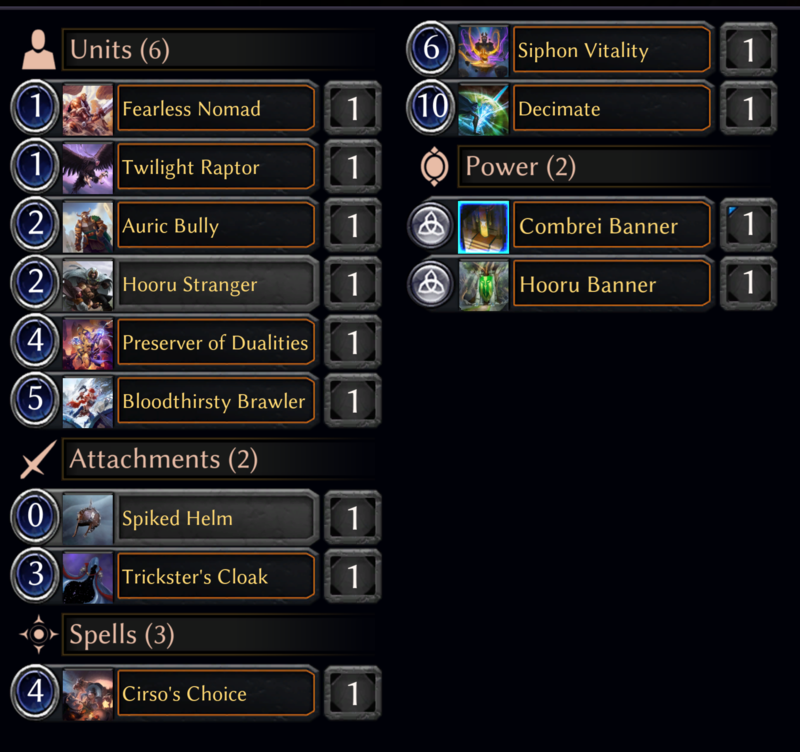 Every card in my deck was reasonably strong, even if not exciting. 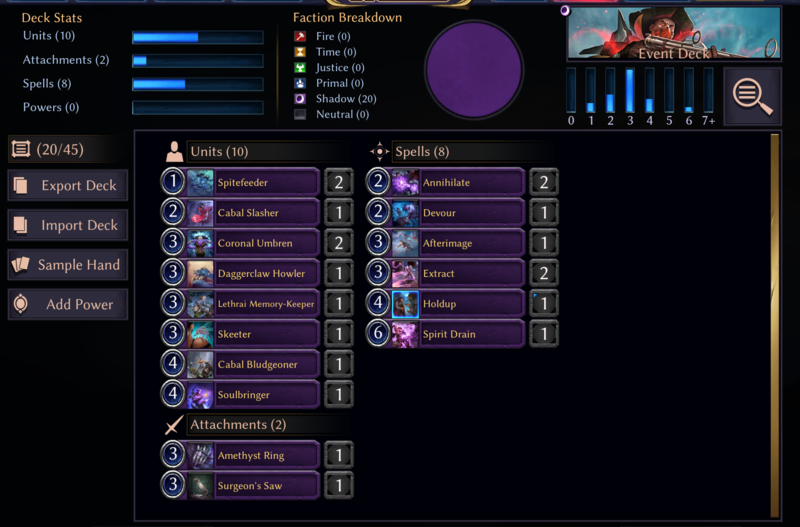 In terms of gameplay, if not power level, my deck played out like a week 3 or 4 deck. 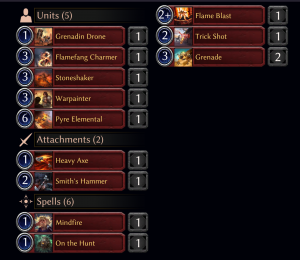 Note that I only played 4 tiebreakers. 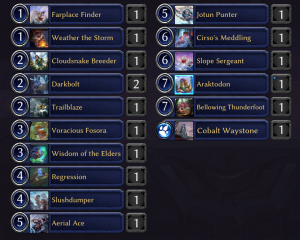 There may come a time where I miss out on a premium legendary at the end of the league due to tiebreakers, but outside of that, tiebreakers are some of the lowest-value games you can play in Eternal. 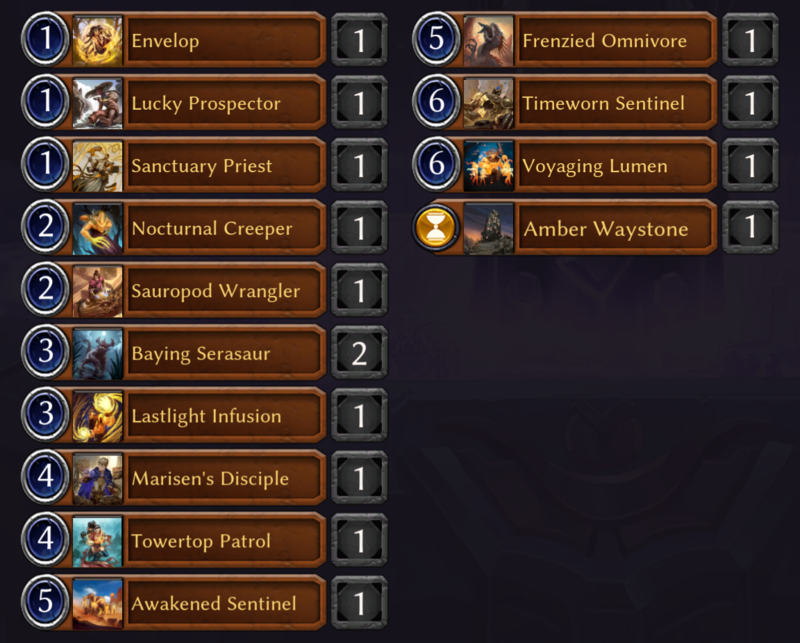 I played a few because I was a little tilted at finishing my last four leaderboard games at 1-3, but once I reassured myself that yes, my deck was good, I gave up on it. 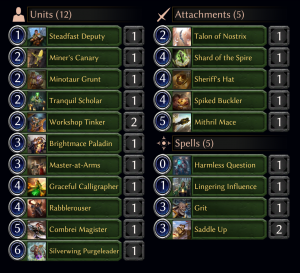 Had I started 8-2 or 9-1, I might have played them all out, but at 7-3 I doubt I’ll be pushing for a top-10 ranking this month, just by the law of averages. I’m not super concerned about raising my finish from 155 to 126 or something like that. 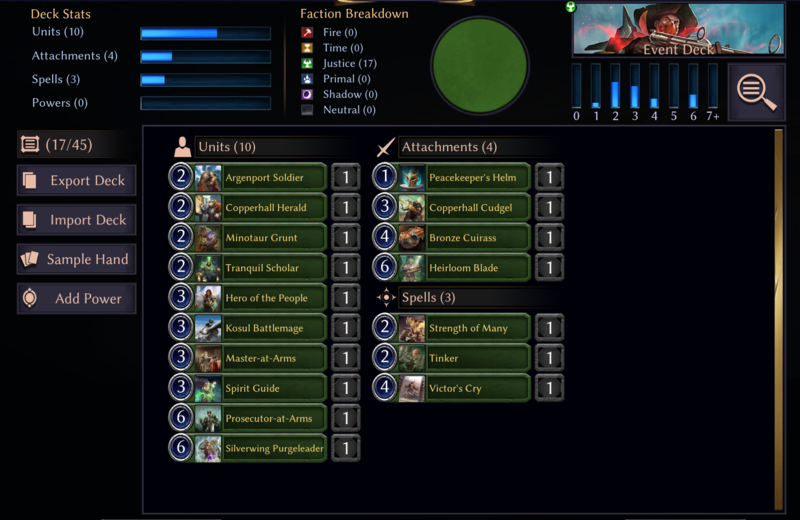 Once you’re in the top 500, your tiebreakers might net you 2 packs. Playing a full 80 games for maybe 2,000 gold just isn’t worth it! 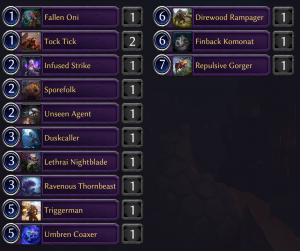 I hope that this has given you something to think about when you crack open that sealed pool in the first week of the month. 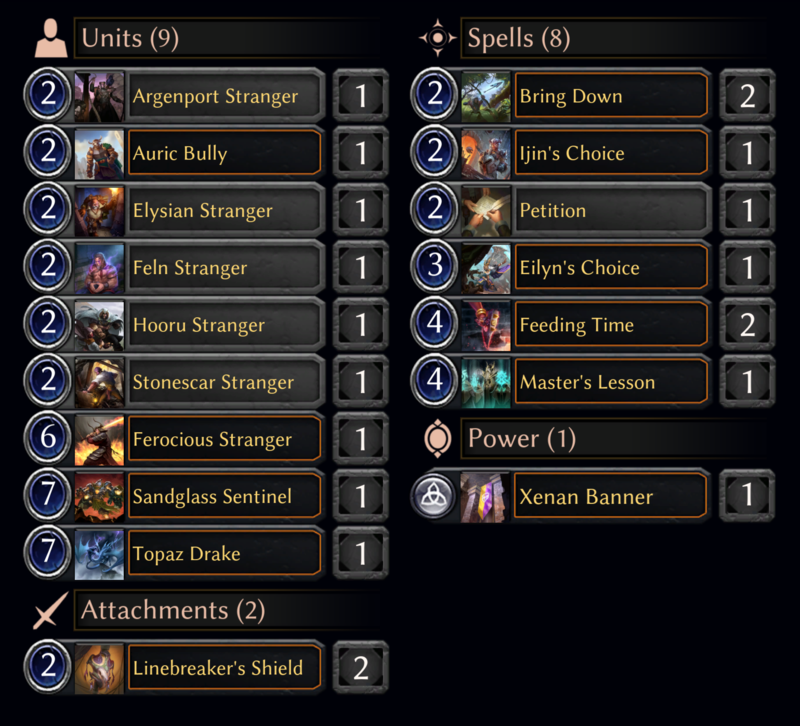 While it does fly against the spirit of the league to not play your weekly games on purpose, it can be a great way to improve your chances of a high ranking when you have a less-than-stellar pool. Missing out on tiebreakers is mostly inconsequential. There are a lot of players out there who don’t even bother playing more than one or two. I tested this at the end of the last league. 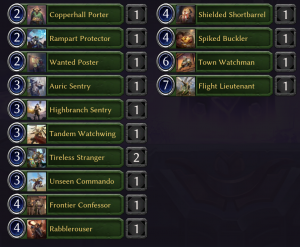 Getting to just two tiebreaker wins raised my rank from 240 to 207. Going purely by averages, the lowest ranked player in the next win bracket would be somewhere in the 120 range (~50% of 28-11 players would win their last game; in reality, it’s more). I therefore achieved 25% of my possible rank increase from tiebreakers in just two games. Furthermore, even had I gone 80-0 in tiebreakers, I likely wouldn’t have even moved up a prize bracket! So don’t feel like you’re missing out by sacrificing tiebreakers. And, of course, feel free to completely disregard this if you simply enjoy playing the weekly games, win or lose.